We just caught BMW's convertible i8 testing for the first time ever. For the first time ever our spies have snagged shots of the BMW i8 Spyder out testing. The hybrid roadster was confirmed to be joining the automaker’s lineup in 2018, which meant a debut in mid to late 2017 was likely. Judging by the amount of camo we’d say that timeline is still intact. The new Spyder will be based off the hardtop i8 which is scheduled for a refresh. The Germans were wise to cover the droptop up to not give away the new look of the coupe. Styling on the two models will differ, most noticeably from the back. The i8 Spyder seen here features powerful shoulders leading up to the rear window, a design first seen on the concept car. BMW wisely decided to put doors on the production version. Other than that the look of the Spyder remains a mystery. Will it have a folding hardtop or a cloth top? We should get a better idea once more spy shots come pouring in. 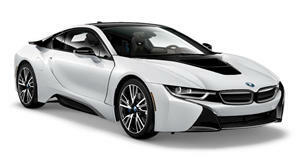 What we really want to know about are the performance upgrades reportedly in store for the i8. A power bump, upgraded transmission, revised battery pack, (possible) inductive charging, chassis improvements and carbon fiber wheels are said to all be in the cards. More range, power and easier charging all sound good to us. All the upgrades the coupe gets will be featured on the convertible which makes us hopeful that someone will race these two shortly after they debut. Just for research purposes of course. There’s no word on a debut date for the i8 Spyder and refreshed i8. Our best guess would be Paris this fall given the fact that BMW already confirmed that the Spyder wouldn’t be on dealer lots until 2018.